The WonderBack™ Pro is another creation of Award-Winning inventor, John Abdo. This remarkably unique and efficacious device is being described by experts as the ultimate self-massager that makes targeting hard to reach stiff and stubborn muscles easier than ever. WonderBack™ Pro features a patent-pending design that is light-weight, durable and specifically designed to provide relief to your stiff, sore aching muscles from the comfort of your own home, for anywhere, anytime applications. Dual-Directional Arcing Motion™ Massage Technology! Massage your back, neck, legs & feet like a professional! Target where you need relief – You control the pressure! Easy to use on sofa, bed or floor! Applications for muscle toning and flexibility. Never be without a massage ever again! “People who see the WonderBack™ Pro buy it! “People who try the WonderBack™ Pro keep it, and use it regularly! Body toning, fat reduction and muscular development–by way of exercise–has always been more effective (and safe) when the applicant understands, and is motivated by the technical aspects for each movement. One doesn’t have to become a myology professor or physiology scholar to attain fitness success. But rather, the [basic] capability to identify then understand the muscles–and their physiological responsibilities and functions, is important for the motivated enthusiast and athlete to maximize results. On that note, those who are serious about getting the best results possible while exercising must begin and sustain this “as a mental process”, not merely a physical endeavor. It’s the brain that operates and controls the body, and it’s trillions of cells. And the better the brain can deliver signals to the individual components of the human anatomical machine; i.e, the tissues and organs, the better that machine will function and perform. Plain and simple; anatomical knowledge is an integral part of health and performance success just like knowing the recipe before making a gourmet meal. The ideal state to strive for in developing a supreme state of health is to 1) Analyze your weaknesses (the mental and physical ones), 2) Design practical, realistic, doable and sensible routine/s that address those needs, then 3), Perform the routine/s with an eager attitude. All three steps are mentally associated. The 3rd, and final step is the only phase that requires physical action. Just like rock climbers first study the routes on mountain edges from afar before attempting to lay one finger on the rock face they are planning to scale, it’s the brain that develops the “know how” and the “want to” to reach peaks in one’s performance and health. Learning your body then can be a simple procedure which brings science into the exercise room –and dinner table– adding wisdom and security to your lifestyle. This article is not meant to educate you on all you need to know to get into terrific shape. Rather, my intention is to inform you that even though I consider myself to be successful coach and trainer, it’s YOU that needs to do the work, and you must ‘know’ and ‘understand’ what you’re doing to yield long-term benefits. Great athletes, even the ones who have been competing for years, consistently study their sport, their body, and the science of human performance. They strive to learn their bodies during the conditioning process that ultimately gains them the edge over their competition. If you’re not a competitive athlete, or don’t have any athletic aspirations let me ask you this. Do you want to look and feel great? Of course you do. In actuality, exercising to look and feel great is far less stressful than training for and competing in sports. The pressure of competition oftentimes over-stresses the athlete and (ultimately) depletes their nervous, hormonal and immune systems. But for the fitness enthusiast who is merely striving for optimal health and appearance, and a boost in energy and well-being, competition related stresses are nonexistent making exercising fun, more casual and self-motivating, while providing plenty of remarkable benefits. By learning the basic fundamentals of exercise and anatomy, and looking at the body holistically, you’ll develop a stronger and longer lasting foundation for the years to follow. Learn as much as you can about your body and develop a strong mental attitude. After that all else will fall into place, along with a few-plus pounds as well! So, if you’re wanting to change the condition you are currently in with exercise and nutrition, don’t be overly concerned [at first] to only acquire exterior results. Better stated, don’t be obsessed with immediate external results. 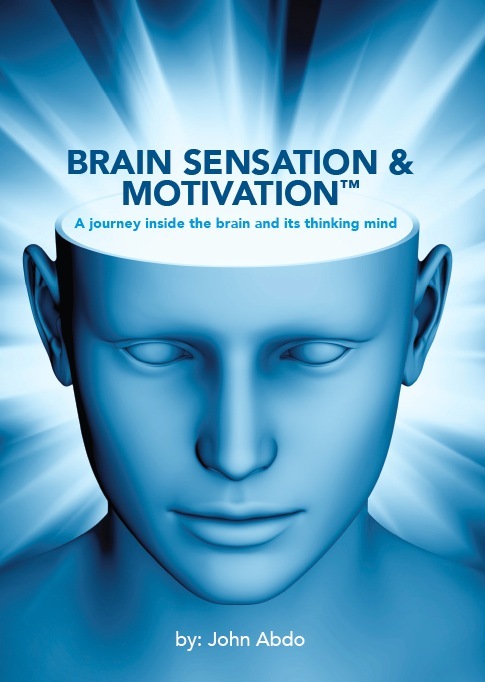 The goal is to condition the controlling, and operating, system of your body –your brain– then navigate that knowledge and comprehension and motivation to transform your aspirations and goals into reality. It makes me wonder that people will read manuals, and even take classes and hire consultants, to learn how to operate their VCR’s, PC’s, cameras, and other techno toys but do little, or nothing, to learn themselves. The human body is often a very neglected and abused organism, statistics prove that. So it’s best to always learn you! Learn your body. If our financial leaders are preaching knowledge is the key to success, then athletes, coaches, fitness and longevity enthusiasts alike can use the same formula to attain their fortunes of health. So let’s begin the pursuit toward a healthy, productive and long life. Get it in your head first then watch your body, and life, take the shape of your thoughts. See you next issue!!! 1. March: Stand up with your fist clenched and arms bent at the elbows. Begin to simultaneously pump your arms and pump your legs. Imagine you’re in an airport and missing a flight. Or maybe a parade and maintaining the cadence of the marching band. Have fun. March as fast as you can. Pump your arms and legs as fast and as high as you can. 2. Pushup: Lie face down and place your hands just outside your chest. Push your body upwards until your arms become straight at the elbows. keep your knees on the ground if you cannot conduct a pushup as shown in the photos. 3. Squat: Obtain a shoulders width foot stance. Maintain an upright back then bend your knees and squat until your thighs become parallel with the floor. Never fall into a squat and stay close to a chair to hold your balance if necessary. 5. V-Sits: Sit at the edge of a chair or bench. Lean rearward then hold yourself on each side to support your upper body and torso. Slowly lift both knees upward as high as you can squeezing your abdominals and hips muscles as your knees lift upward. slowly return your feet to the floor then repeat until all 30 seconds has expired. 6. Leg Raise [Front/Back; Right Leg]: Stand upright and hold onto a broomstick or chair for balance. Keep your left leg firm and straight then slowly lift your right foot upwards keeping your right knee rigid. Lift your right foot as high in front of your body as possible then slowly pivot it behind your body to be lifted backwards as well. Swing your leg in an forward/rearward pendulum motion slowly and with control, then switch to your left leg after 30 seconds. 8. Calve Raise: Stand upright and hold onto a broomstick or chair for balance. Obtain a shoulders width foot stance with knees rigid. Simultaneously push the toes of both feet into the floor so your heels rise as high as they can. Pump upwards and downwards bending only at your ankles as fast as you feel capable for 30 seconds. 9. Jumping Jacks: Everybody has done this movement back to high school P.E. class, but many of us more “mature” folks have forgotten them, or their effectiveness in fitness. Conduct short upward jumps while spreading your legs to each side all while trying to clap your hands over head. Strive to get into a tempo jumping-&-pumping away for 30 seconds. 10. Crunch: Lay face up with knees bent and both feet flat. Place your hands onto your abdominal muscles then lift your head and chest upwards just a few inches feeling your ab muscles tightening before returning your back to the floor. Continue this until all 30 seconds have expired. [This is an old fashion way of tightening the abs. But too many crunches might over do it. So 30 seconds is all I will allow you]. 11. Swim Strokes [Front/Back]: You’re swimming in a race; maybe it’s the Olympics? Swim the front stroke, swim the back stroke. Rotate your arms in wide circles slightly pivoting your waistline and torso just like you’re in the pool and need to swim faster. Swim forward for 15 seconds then swim backwards for another 15 seconds. Always reach as far as you can. 12. Leg Kicks: Sit at the edge of a chair or bench. Lean rearward then hold yourself on each side to support your upper body and torso. pretend you have a loose pair of shoes on your feet and you simply want to flick them off of each foot. Lift your right knee upward then follow with your right foot trying to kick your shoe off then return your right foot to the floor followed with the same action with your left leg/foot. Never snap your legs or knees but instead extend your feet with control. 13. Toe Touch/Overhead Reach [Seated or stand]: Either standing or seated, lean forward to reach your fingers toward the floor. Maintain your balance by keeping your feet flat and being conscious of your body position at all times. Return upward after your downward reach while surpassing the starting [standing] position then reaching upward as high as you can, even raising on your toes if you are standing, to gain as much height as possible. 14. Crossover Toe Touch: Stand upright with a wide foot stance and arms spread wide open to each side. Lean forward twisting your upper body toward your right side trying to bring your left hand toward your right knee or right foot. Slowly return upward to your standing position then repeat to the other side of your body so now your right hand is lowered toward your left knee or foot. – Perform each movement for 30 seconds then move onto the next. If you cannot make 30 seconds then perform as many as you can within that time then move on. A digital timer is best, one that’s easily visible. – Once a full circuit is completed take a 1-2 minutes rest then repeat. 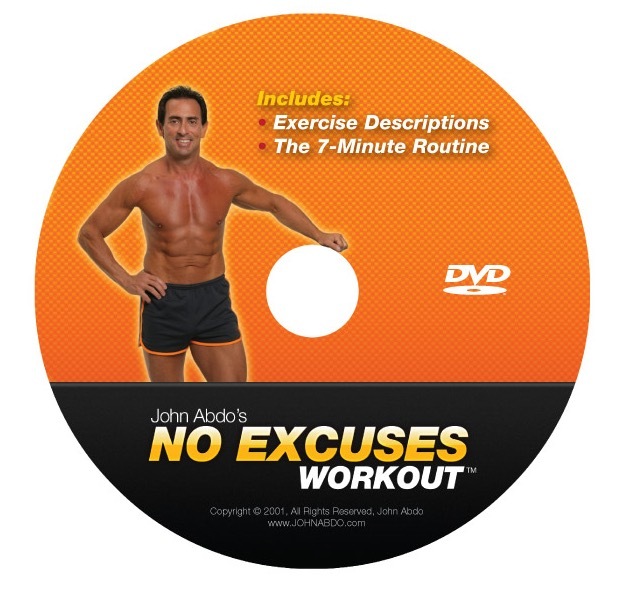 No Excuses™ Workout has become one of John Abdo’s most popular DVD exercise sessions for over a dozen years now. The workout starts out with John explaining all the exercises with complete technical information then you just skip tracks and jump right into the amazing 7 minute routine that targets EVERY muscle in your body while boosting your overall cardiovascular health, burning fat and shaping muscle all at the same time. You’ll become stronger, more energetic and leaner, and you’ll also increase your energy levels and coordination. NEW is challenging yet fun and, more importantly, you’re completed with this amazing total body routine in only 7 minutes. THE SIMPLEST FASTEST WAY TO BURN OFF BODY FAT AND GET YOUR BODY INTO SHAPE. This is a “must-have” DVD as you can perform it anytime and anywhere, hence No Excuses™!